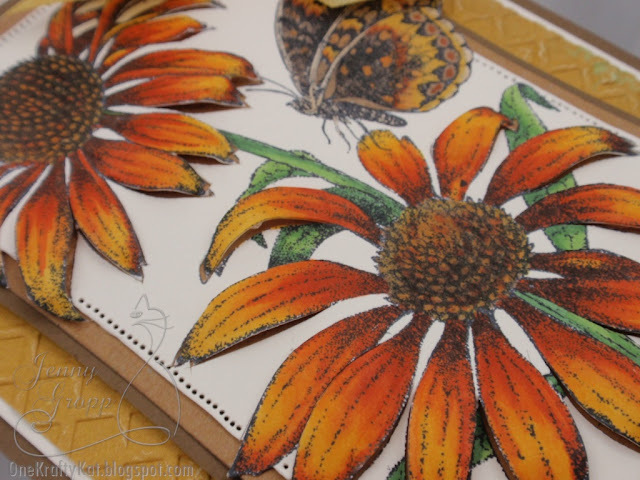 Here’s what we have going on this week at Serendipity Stamps…. Stamp Of The Week – Each week we’ll feature a Stamp Of The Week at 50% off to highlight some of our lesser known, but beautifully rendered stamps and cards. This week it’s the Watering Can – perfect for those of us just itching to get into our spring gardens! This beautiful card was created by Jeanne Jachna for Operation Write Home. Check out Jeanne’s blog for more info about the card and about this great project. Acetate – This week our Design Team’s challenge was to use acetate in their project. Remember using acetate to make shaker cards full of beads? Well we’ve come a long way baby! Want to play too? We’ve got 10 sheets for just $1! Click each DT members’ name below to go to her blog and see her acetate creation with full instructions. Jeanne Jachna – 3 Projects! I thought I would share my process today with this card. Instead of stamping and cutting out multiple flowers to add dimension, I did something a little different. 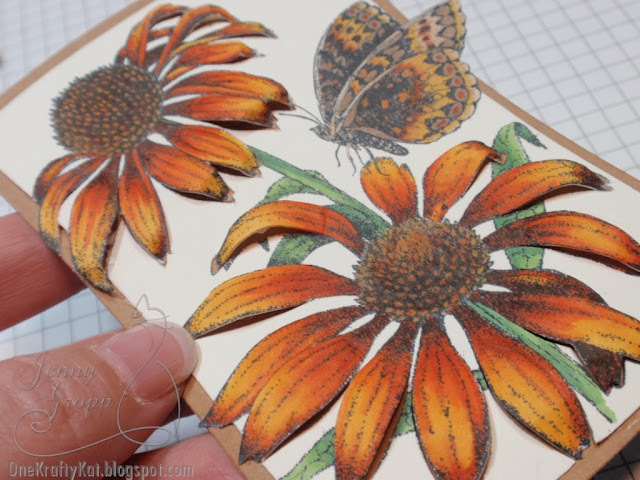 Here is the image… aren’t these Coneflowers beautiful! I used the out of the box technique and Spellbinder’s Reverse Wonky Rectangles to frame the image. You can see the Copic marker I used to color the flowers. I used a craft knife to cut out the petals of the flowers, leaving the center of the flowers intact. You can see above how I cut them. I used a foam pad and silver ball stylus to press against each petal curling them slightly, adding dimension. Next, I used Dimensional Silicone on the back of each cut out petal. I added glue to the flat parts of the panel and then glued it down… the petals stay popped up with the aid of the silicone. You can see how the petals stay popped up in the above picture. I colored some seam binding with Copic Y26 and made a bow with it, adding some piercing around the edges. the flower panel is popped up with foam tape. All of my straight line layers were made with Perfect Layers Rulers. Now is the time to treat yourself with that stamp and die set you’ve been coveting! Or how about the Floral Alphabet – it’s spring! Splurge! During checkout, just enter “40OffHighest” in the coupon code box, to get 40% off the highest priced item in your cart. One coupon per customer. Expires Wed. March 21st. And don’t forget – our stamp of the week is Pillows. Here’s a bit of inspiration for you – two lovely Mother’s Day cards made using our Floral Alphabet. These cards were made by Lynda Benden and Jeanne Jachna using M-Magnolia and O-Orchid. Serendipity Stamps DT Alumni Holly Craft posted this tutorial to show how to use the “registration marks” – the small circles on our outline dies – to center your stamped image perfectly before you cut it out with your outline die. When I get a new die, I like to just cut and play and before long the die starts talking to me…..what, your toys don’t talk to you? Both the egg and heart come in the stamp image, the filigree die and the shape die. Since the heart design is so detailed, you might need a little help from a craft knife to get any of the small pieces out. Check the die cut before you began taking it out….you can see if it cut all the way through. If it did not, run it through again. Another solution is to use a shim. All of this is determined by what type of die cutting machine you are using. I am using a Grand Calibur and had no trouble. I have used a metal shim from Cheery Lynn Designs on very delicate designs but did not have to use it on these. To cut out a stamped image, die cut an example and use the outside as seen below. Notice there are two registration holes cut. Center the outside around the stamped image and then make a mark in the registration marks. 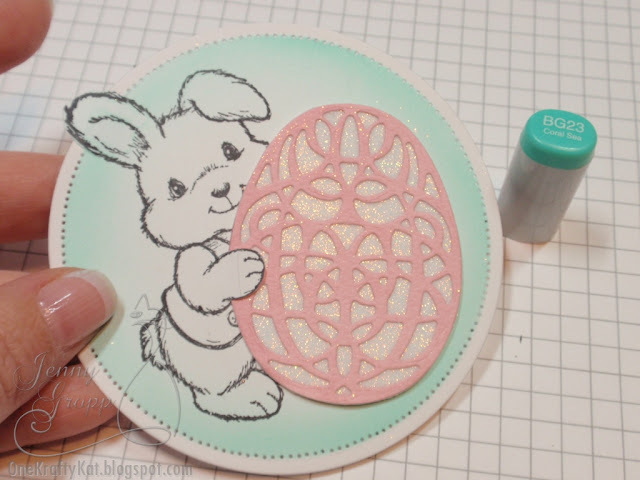 (On the egg above, I am embossing the design in clear on watercolor paper and then will do a wash of different colors with the stamped image acting as a resist). Next, position the die over the stamped image, lining up the registration marks. Use some type of repositionable tape to make sure the die stays in place….yeah, I probably could have been neater with the tape, but it doesn’t really matter. 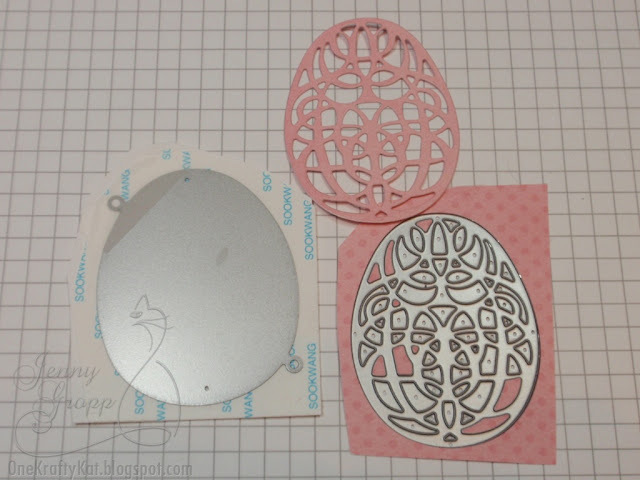 Once you cut the die out, you will have a beautiful heart with the stamped image that you can use in conjunction with the solid die cut and the filigree die cut. The stamp can also be used as a background or as decoration for your envelope. Check out Serendipity Stamps to see these great new additions to their line and let them know how much you like them! I will get some cards made with all these die cuts I have produced and share them soon! 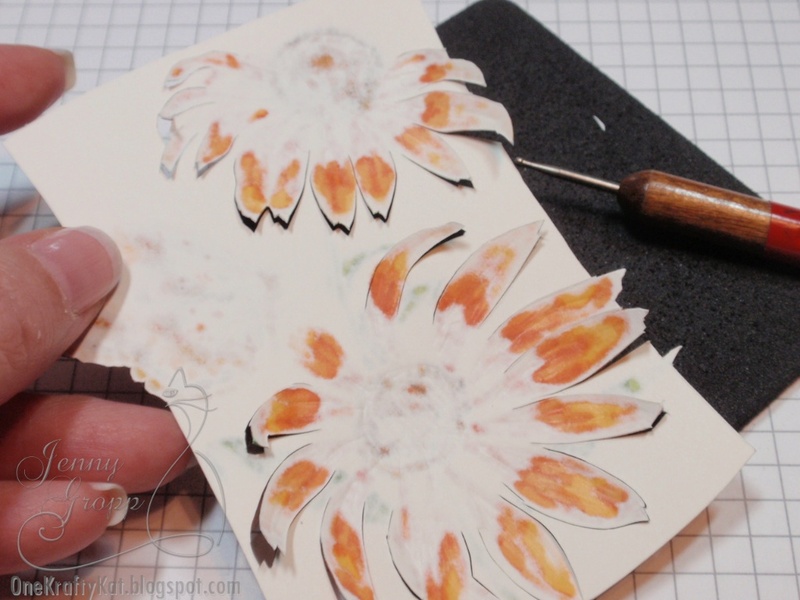 It’s coupon time at Serendipity Stamps! Just enter the code “40OffHighest” during checkout to get 40% off the single highest priced coupon in your cart. Coupon expires Wed. March 21st. One coupon per customer. STAMP OF THE WEEK – Each week we’ll be featuring a stamp of the week for 50% off. This will show off some of our lesser known, but beautifully rendered cards and stamps. This week’s stamp of the week is Pillows. 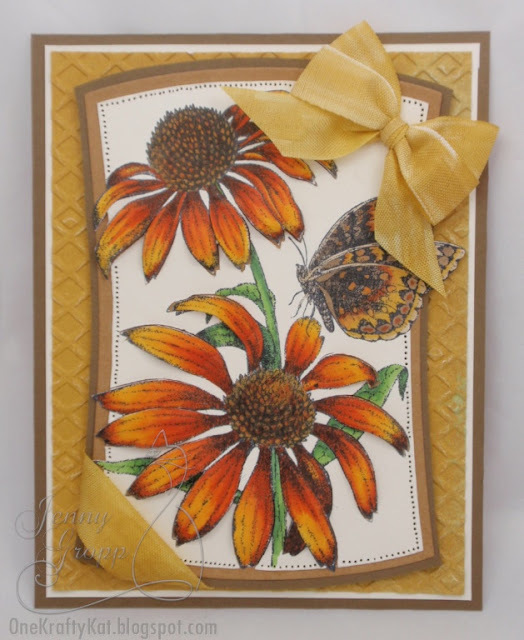 Kathie Bailey of the Serendipity Stamps Design Team created this beautiful card. 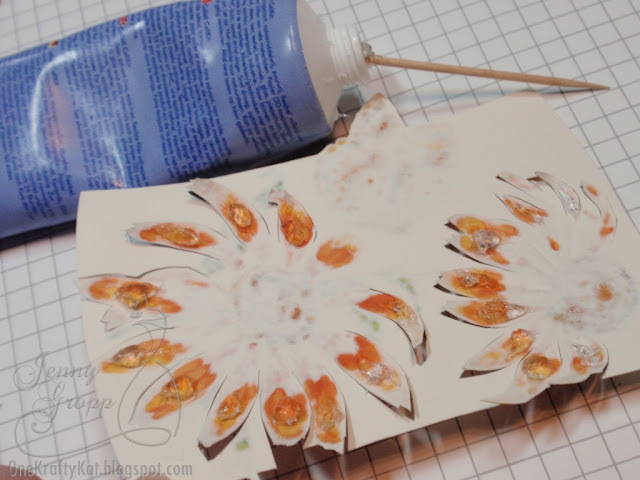 Jenny Gropp posted this tutorial for our DT’s blog hop featuring our new line of dies. Enjoy! I paired the Easter Egg Dies up with this cute little rabbit stamp. I’m still addicted to making shaped cards… so again I pulled out my Spellbinder’s Grand Dies to create the card base and several layers. LEFT: put a piece of wide Scor-Pal Tape on to card stock. Cut the solid Egg shape. 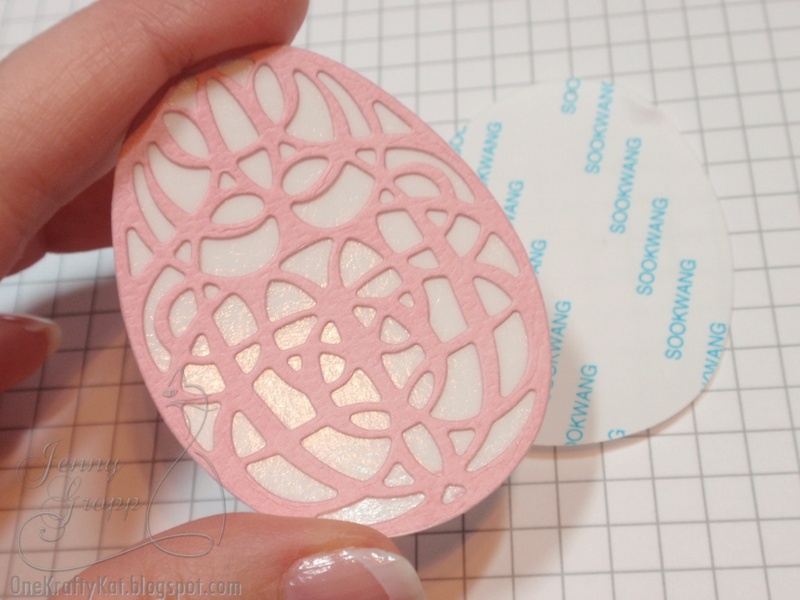 RIGHT: Cut the Scroll Egg Die using pink paper. You can see the die cut nice and clean. I use a Grand Calibur Die Cut Machine and no shims to cut this. Remove the protective covering from the Scor-Pal Solid Egg Shape, revealing the sticky surface. 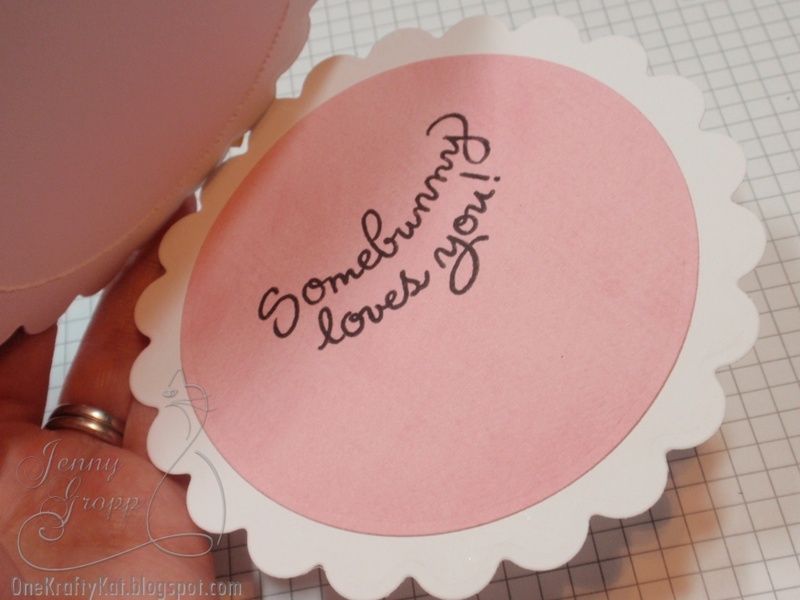 Add the scroll pink die cut directly over the adhesive. The open areas are still sticky, so be careful not to touch them or get anything stuck! Next, I added Transparent Micro-Fine Glitter to the Egg. Above you can see that I liberally dumped some glitter over the egg. I used my finger to push the glitter in to all of the open areas. 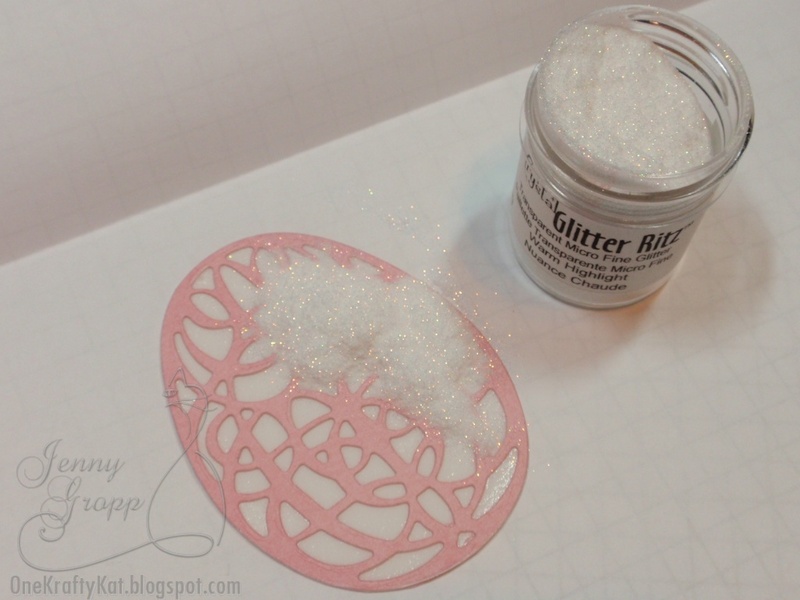 The glitter immediately grabs to the adhesive. 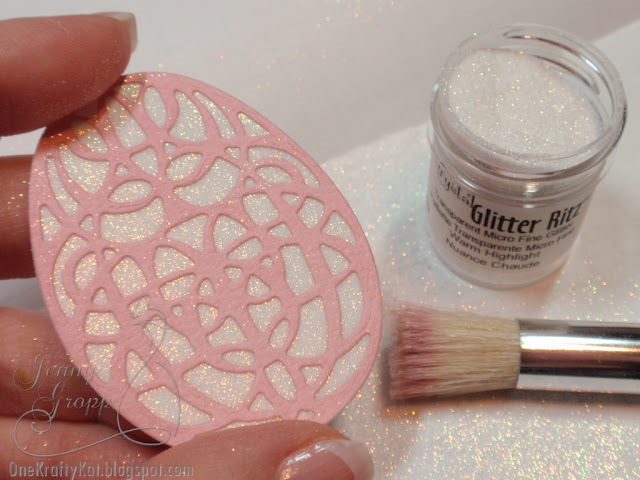 After completely covering and rubbing the glitter in to all the open adhesive areas, use a hard bristled brush to help remove any stray glitter. 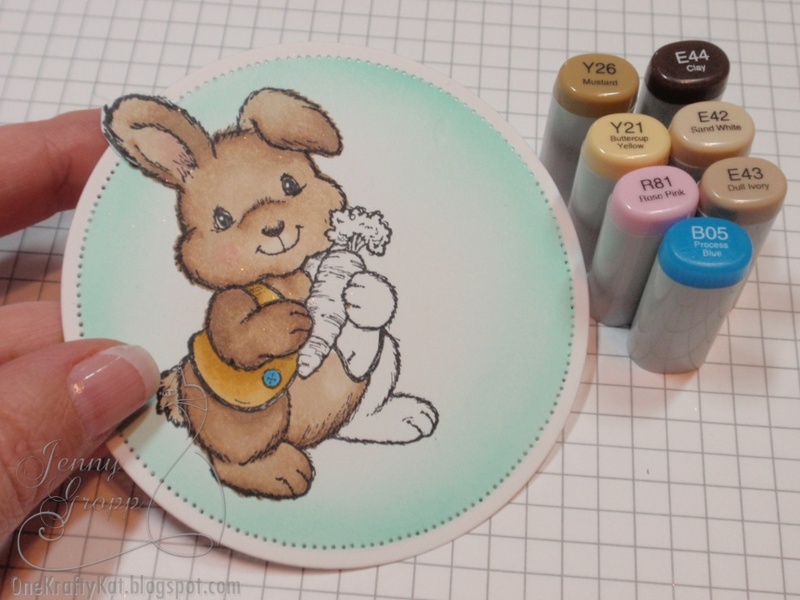 Above you can see that I stamped the little rabbit and cut it out with a Circle Nestie. I airbrushed a little BG23 while the paper was still in the die. I also added my piercing while the paper was still in the die, using the inside edge as my guide to stay neat. I used an Xacto Knife to cut out the little rabbit paw. I lifted the paw edge up and tucked the egg under it. Now on to the coloring. Since the egg will be covering up the right side, I didn’t bother coloring that area. You can see the Copics I used in the above picture. I added the cute “Somebunny” sentiment on the inside. You can see I added a few more details to the front of the card…. Adhesive Gems, Bow and Glossy Accents over the Eyes and Nose. The bunny circle is popped up with foam tape to raise it up a little higher. 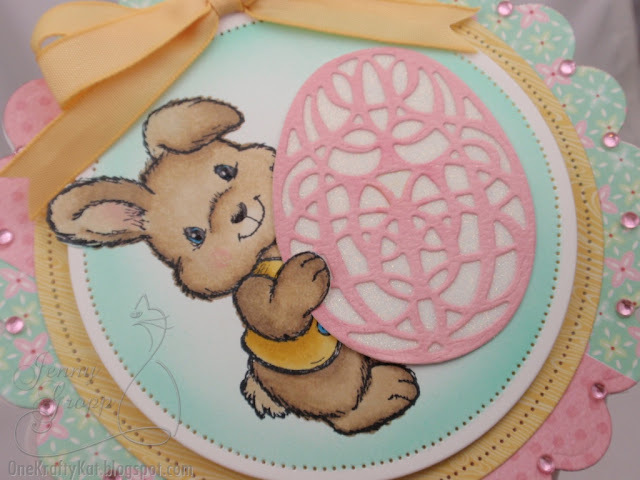 All of the paper is from Jillibean’s new 6s6 paper pad – Southern Chicken Dumpling Soup—adorable little Easter patterns!!! This tutorial was posted in Jeanne Jachna’s blog for our DT’s blog hop featuring our new line of dies. Enjoy! Jeanne used the Egg Scroll Die for her instructions. Here are some simple to cut out your stamped images perfectly centered. 3. Center the template over your stamped image and tape down. 4. Insert die in opening – it will not slide around when it is seated completely. Once positioned tape die down. 5. Run taped down “sandwich” through your die cutter for a perfectly cut image. NanaConnie – who commented on Jeanne Jachna’s blog. These ladies will have their choice of either our Egg Stamp and Die set or our Heart Stamp and Die Set. Want to see all the lovely creations one more time? Just click on the thumbnails in the gallery above. Want detailed instructions for using our dies? 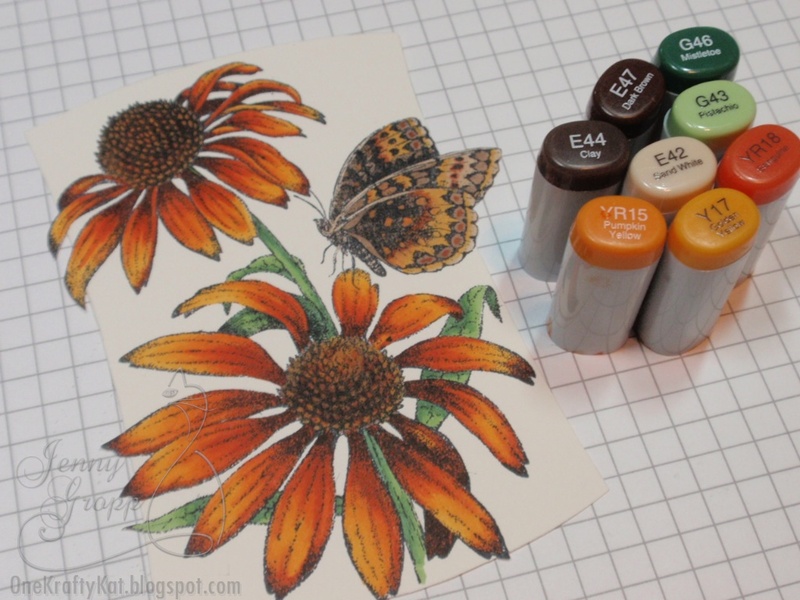 Jeanne Jachna, Jenny Gropp and Holly Craft have provided wonderful tutorials in their blog posts.